In my education workshops, people explore their creative side through the tactile experience of music making. 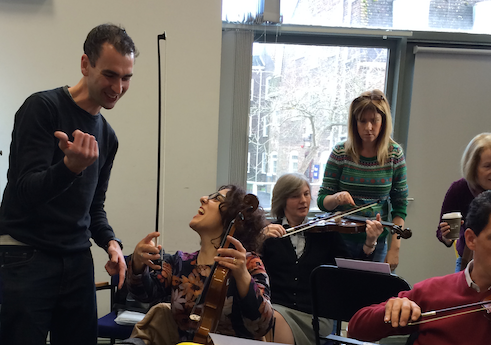 These inspirational sessions foster team building and enhance interpersonal skills while learning the basics of instrumental music making on classical string instruments. They transcend the hierarchical structure so often imposed in work and learning settings. Each person plays a part in an evolving, creative, collaborative musical ensemble. The activities embed leadership and ownership skills while validating personal potential through problem solving and achievement. Non-verbal physical cues and conducting are introduced and balance with the physical coordination of playing instruments as your team work to create a rewarding performance together. There is no expectation that people will have ever even been in the same room as a stringed instrument, and the entire session is based around fun and enjoyment through experience and sound. Laura’s workshops foster awareness of how people interact, builds self-efficacy, and affirms interpersonal skills as we learn the basics of instrumental music making with cellos, violas, and violins. She can facilitate any number of observers and 25 active participant-performers (50 if in partners), who will directly explore the creative and interactive process of learning through the tactile experience of music making. With instruments provided, people work in pairs, taking turns with playing the part of the student, actually with the instrument, and then assuming the role of teacher. A typical workshop begins with an awareness of the physical requirements, breaking down the process of ‘playing’ the instruments into steps and all are able to quickly see the compounding effect of being immersed in a new learning experience. The impact of the session is magnified because being a ‘beginner’ at something is often assumed to be easy, or for children, yet when adults encounter new concepts, skills, and challenges, we must revisit the processes in order to best facilitate excellent learning. The components necessary to learn are progressively and carefully presented in an order that ensures student success. The activities embed leadership and ownership skills while validating personal potential through problem solving and achievement.Non-verbal physical communication cues are introduced and balanced with the physical coordination tasks of playing instruments as we work to create a rewarding performance together. The novel situation allows a fresh and direct application of communication principles illustrated in the session, and challenges clarity of feedback because of the mixture of using words, sound, and physical motion. There is no expectation that people will have ever even been in the same room as a stringed instrument, and the entire session is based around fun and enjoyment through experience and sound. The future of communication and learning is in experience, and this transcends the written textbook alone. We see that the written musical score is simply an artefact, and learning happens through awareness, doing, and understanding. Methods and applications are discussed throughout the session. Participants are encouraged to reflect on their own professional practice, and how to apply the principles through using another novel activity, where they are comfortable as leaders, to illustrate how this type of shared experience can inform excellence in learning, teaching, and performance. This workshop is intended for a wide cross section of the community, and participants in the past have ranged from students to managers, doctors, bankers, pilots, support workers, charity volunteers, and professors. It transcends disciplines and because of the core communication and intrapersonal skills used, is equally useful for those in the sciences, humanities, medicine or any other discipline. It is a session that is a useful learning experience for both those new to their profession as well as those reflecting on years of experience. This session is not just talk. The reason it is so effective is because participants experience the learning first-hand instead of being told about a theory, or viewing results of an intervention second-hand. It is also effective because people do not expect either to play real instruments, or to be successful, and it is not often that people can be genuinely put in that situation, that is all too common for students. Those inhibitions and assumptions are put to rest through the active, informative, fun session. New ideas about how to encourage others to approach learning through awareness, experience, and reflection. Through awareness, experience and reflection we can gain insight into how we learn and can effectively work with one another to positively foster attitudes, processes, and attainment. With clear instruction, we can foster self-belief and facilitate achievement. Fun, challenge, and learning new and complex tasks can go together in the workplace, whether an office or classroom. We can communicate effectively with sounds, actions, and words. Here’s what Dr. Fabio Aricó, Senior Lecturer in Macroeconomics at UEA outlined how it impacted his pedagogic practices here: Experiential Learning: I played the Violin!